I believe it was back in early 2011 when I first met Erik Weibel. I had been blogging for a few months but had struggled to give my blog a cohesive direction. That was back when I thought publishers would knock down my door if I posted a few samples of my writing online. I had also just received a Kindle for Christmas, which opened up a whole world of self-publishing for my middle grade novels. 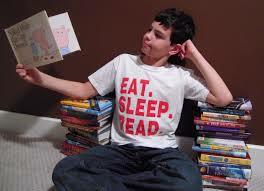 As I got my start as an indie, it seemed a natural fit to feature children’s literature on my blog. About that time, I was delighted to receive a comment from an eager 9-year-old who loved to read and had just started a review blog of his own. I had no idea what a wonderful friendship that contact would lead to! I was impressed with Erik right away. He’s an advanced reader, and he writes with a clear, natural, easy-to-read style. His reviews are balanced, and he handles a range of literature, often suggesting books for different ages, reading levels, or interests. He interacts with his blog audience with grace, humor, and respect—never talking down to kids or appearing uncomfortable with adults. He’s been a great encouragement to my boys (one the same age, one younger, and both low readers) and never misses a chance to respond positively to their often stumbling homeschool blog posts. As a teacher, I’ve read many stories written by children. As much as I like to encourage young authors, their creations can be tedious to wade through. That is NOT the case with 11-year-old Erik’s new book, The Adventures of Tomato and Pea: A Bad Idea. Yes, the plot involves superhero vegetables (they’re Smidges, actually), which aren’t usually my fare, but it’s written so well, so professionally that I’m not just celebrating this release as a teacher, I’m celebrating as a fellow author. Tomato is the great crime-stopper from Oarg. He’s a planet-wide superhero who single-handedly stopped an alien invasion. Now one of his own, a villain named Wintergreen, is seeking to eliminate him and conquer the world. Their misadventures, thanks to some of Wintergreen’s bumbling cronies, crash land them on an unknown planet—EAR-TH. Will Tomato be able to stop Wintergreen? Will he be able to save his friends? Will he be able to return them home? This young author also has a handle on creative word pictures. Here’s a description of Sergeant Marsh (whose name is also well-chosen) by way of example: “Marsh was round like a ball that was starting to lose its air. Marsh’s color made him look like a big mud-pie.” Or this description of Pye: “His shape reminded Wintergreen of a crayon that was overused.” Are you starting to get the idea that this 11-year-old doesn’t really write like an 11-year-old? Now take in this larger sample of Erik’s detail and smooth writing style (and humor again): The electrical systems failed and everything went black. The ship shot through the air, bounced off of a boulder, shot through tree tops, skidded across several rooftops and crashed into the chimney stack on a building. The lower section of the ship was lost in the impact. Fortunately the upper section, containing the control room, was not severely damaged in the landing.After a few minutes a faint glow appeared in a corner of the control room. “I knew these would come in handy,” I (Pea, the over-packer) said happily as I passed out glow sticks to the others. Eleven-year-old Erik plans to eventually take over the world. (Actually, I think he was ten in this pic.) 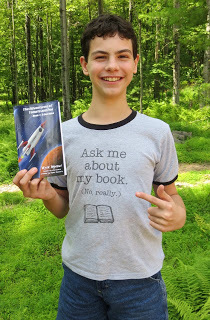 Right now he’s a bit too young, so he is spending time as a sixth grade student, book review blogger and hopeful writer. And finally, Tomato and Pea resonates with some very positive themes like cooperation, friendship, trust, perseverance, second chances, and never leaving anyone—not even an enemy—behind. I’ll grant that not all adults will want to read through this space adventure, but I guarantee that the ones who do will be impressed. And I’m certain that other kids are going to eat this one up. Who knows what they like better than one of them? Two thumbs way up! Read my son’s review at his Story Boys blog. Want to snag a copy? I wanted to make sure this post followed me to Bookworm Blather. 🙂 Congratulations! A book signing? That is SO COOL! Have a great time. When is it? It is on November 2nd! I can’t wait! Erik is amazing! I’m very excited for him!